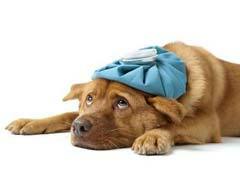 Weakness and lethargy are vague but common symptoms of illness in dogs. And a number of factors, some quite serious, can make your dog lethargic or weak. The average dog sleeps for more than 10 hours a day, which means you may find him dozing off multiple times over the course of a day. Sometimes, you may confuse your dog’s relaxation time as lethargy, and start worrying for no reason. On the other hand, if your dog is not eating properly, not responding when you call him, or doesn’t feel like walking, playing, or doing the things he normally enjoy, it most likely means that something is seriously wrong with your dogs health. Infection: Any type of infection, including distemper, parvovirus, leptospirosis and kennel cough, can make your dog lethargic. Metabolic Disease: A diverse range of chronic conditions can result in weakness and lethargy in dogs. These include liver problems, heart problems, hypoglycemia, and diabetes. Medications: A wide variety of medications can cause lethargy or weakness in your dog. If you notice weakness right after starting a new medication or using a new worm or flea product, stop using it and call your vet immediately. Anemia: Anemia is a health condition that progresses when the blood lacks adequate healthy hemoglobin or red blood cells. Hemoglobin is a key component of red blood cells that binds oxygen. If the body has abnormal or too few red blood cells or hemoglobin is low or abnormal, the body’s cells will not get sufficient oxygen. Symptoms of anemia include lethargy, which occurs because the organs aren’t receiving enough oxygen. Hypothyroidism: Hypothyroidism, also known as underactive thyroid disease, is a common disorder in dogs. This is where your dog’s thyroid gland does not produce enough thyroid hormone. In case of low thyroid hormone level, the body processes slow down, which means less energy and your pet’s metabolism slows down. These are just some causes that can trigger lethargy in your dog. It is best to contact your vet right away if you have any concerns. Because lethargy and weakness can indicate anything, from a continuing illness to a deadly disease, the best thing you can do is get in touch with your vet as soon as you start noticing any of these symptoms. 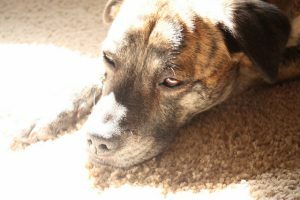 Remember that it is okay if your dog is feeling exhausted after a good exercise session or a cat chase, but if the behavior continues, this becomes a cause for concern. You should only start your home care once a veterinarian, who will carry out some tests and do a full diagnosis of the problem, has handled your dog professionally. After the therapy is initiated, administer the prescribed medication as suggested by your vet. Observe your dog’s behavior, appetite and general activity and notify your vet as soon as you see the symptoms change or get worse. Remember that home care shouldn’t replace professional help as it will only make the situation worse. This is true as well for emotional support animals.